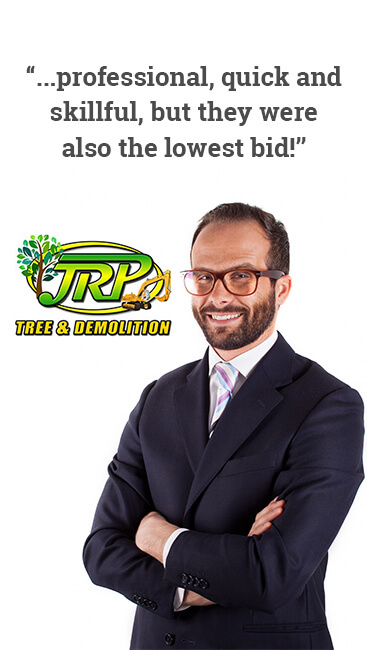 JRP Tree & Demolition is your Top Rated Local® tree care provider here in Houston. We provide a wide variety of tree services, including tree removal, tree trimming, tree topping, tree fertilization, stump grinding, and emergency tree care services (among others). Now, as your local tree care experts, we strive to be the best in the business. That means that we provide unparalleled customer service, unmatched expertise, and unbeatable service. Here are a few more reasons why we’re the top tree care company in the area. If you live in Houston, well, so do we. We work exclusively in Houston and the surrounding area. That’s beneficial for our local economy. Plus, since we constantly work with trees that are popular in our climatic region, we have built ever-growing knowledge about tree care for our local trees. We’re here to make our community glow as it grows — providing tree care services that leave our neighborhoods looking beautiful. We also serve our neighbors that are near Houston. You can see a full list of our service locations, or feel free to give us a call if you’re curious whether or not we can help you out! In short, our certification ensures that our tree care efforts give your trees their best chance to flourish. We employ ISA standards in many of our tree care services, from trimming trees properly to maintain their health, to cutting down old trees with care, so that your property and our employees remain safe. We also receive continuing education to maintain our certification — ISA arborists must recertify every three years to maintain their title. You can learn more about the International Society of Arboriculture from their site. We’re bonded and insured, so you can rest assured that in the rare event that an accident does occur, you won’t have to worry. While you might not think this is a big deal, we assure you that it’s truly important when you’re selecting a tree care contractor. There are numerous contractors out there who aren’t insured and bonded. That means that your property isn’t protected in case something happens, and it may mean that you’re held liable if a contractor should hurt himself. Now, think about all of the tasks that we take care of: trimming high up branches, grinding down stumps with heavy machinery, cutting down fully grown trees (that may fall on your property or passersby if not performed correctly), you name it. All of these tasks have some inherent danger — danger that we strive to minimize. But, accidents do happen, no matter how much precaution you take. That’s why we’re bonded and insured. Even when accidents do happen, you can rest assured that we’re bonded and insured, so your property’s value is protected. The right tools make easy work, even for the hardest projects. Plus, when we use the right tools for your tree care needs, we improve the safety of our processes. Some of our heavier equipment includes a cherry picker, stump grinder, a front end loader, bulldozer, and skid-steer (for clearing trees from properties). We also, of course, have a variety of smaller hand tools, from pruning shears to chainsaws. So, no matter the size of the job at hand, we have the equipment necessary to do the job right, and to do the job efficiently. Tree Trimming: There are a dozen reasons why you may need to trim your trees. You may have branches that are approaching an electrical line, you may have branches that are obstructing your favorite view from your deck, or you may have branches that are rotting or dead. Regardless of your unique situation, we can help. Learn more about our tree trimming services. Pruning: We provide pruning services to keep your tree healthy and thriving. Pruning your trees isn’t just a good practice to give them the shape that you’d like. It also helps your trees to grow healthy. We prune specific branches to ensure that your tree’s branches receive plenty of sunlight and nutrients, which support new growth. Tree Removal: If you have an old tree on your property that’s at the end of its life, you may have no choice but to have the tree cut down and removed. Fortunately, with JRP Tree and Demolition, that process is simple. We have the right tools to tie off chunks of your tree as we fell it, so that your property won’t be damaged. Stump Grinding: After we cut down your tree, we can grind down the stump to below surface grade. We use a heavy-duty stump grinder to make quick work of your stump. We can grind down old, existing stumps too. Tree Fertilization: Tree fertilization is a great routine to improve the health of your trees. Have your trees fertilized at least once per year to ensure that the soil has the nutrients necessary for tree growth. New Tree Planting: Properly planting your trees gives them a better chance at a long, healthy life. We know a lot about planting trees, after all, we’ve been planting trees for three decades. We also know about specific species that grow here in Houston, and how to plant them properly. Land Clearing: If you have a lot that is packed with a thicket of trees and shrubs, we can clear your land so that you can start on your next project. We utilize heavy machinery, including bulldozers, front end loaders, and skid steers, to quickly clear even the most overgrown lots. Tree Preservation: When you have a tree that is on its last limb, we may be able to help. As trained arborists, we know how to identify diseases and pests, and we can assess the damage that they’ve caused to your trees. Let us take a look at your injured trees, and we’ll set a plan in motion to nurse them back to health. Cabling and Bracing: Trees can uproot if they grow improperly, or if they suffer damage from adverse weather conditions. Fortunately, some trees can be saved through the use of cabling and bracing. Our cabling and bracing services keep your trees from toppling, so that they have a better chance at growing deep, strong roots. Installing Root Barrier: Speaking of roots, we also install root barrier to protect your property from the roots of your trees. Root barrier keeps roots from working their way into your home or damaging your home’s foundation. We also install root barrier to protect driveways, buried infrastructure, and any other structures that you may have on your property. Shrub Pruning: Just as we do for trees, we can do for shrubs and bushes around your property. We prune and shape bushes to improve their look and health. Emergency Tree Care Services: When you come home to a tree that’s been struck by lightning, or a tree that’s slowly leaning into your home, you have an emergency on your hands. That’s why we provide emergency tree care services to protect you and your property. Feel free to read more about our full list of tree care services. We strive to provide premier tree care services that meet or exceed our clients’ demands and vision. From start to finish, we’ll work with you to make sure that the job is done just as you’d like. If you’re perusing the web for the best tree care providers to serve your needs, you don’t have to just take our word for it. Take a look at our client testimonials — our reviews say it all. With JRP Tree & Demolition, you’re sure to be satisfied with the outcome of your next project, whether it be planting a few dozen trees on a new property, or trimming an old tree that’s been on your property for decades. Count on us for any and all of your tree care needs, and find out the JRP Tree & Demolition difference for yourself! Get in touch with us to get a free quote for your next tree care project!